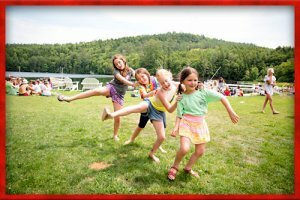 Camp Lochearn for Girls Archives - Lochearn Summer Camp for Girls - Our Girls Sleepaway Camp Blog! You heard it here first! If you love the slide, you will love another exciting new part of the Lochearn waterfront this summer! Said to be the hottest new camp craze, campers will have the pleasure of enjoying our new Water Trampoline! Last summer’s production of The Lion King had everyone on the edge of their seats with anticipation. We laughed with Timon and Pumbaa, sang along with Nala and Mufasa, and (spoiler alert!) cheered as Simba reigned over the Pridelands at the end! This summer, we are excited for our campers to bring the story of Beauty and the Beast to life! Campers in Session 1 and Session 2 will have the opportunity to join the four-week Theater II performance class. If theater performance isn’t your forte but you love the art of drama, our Theater I class is the perfect way to learn the techniques of improvisation and acting. Sign up for Theater I and Theater II class this summer for an exhilarating experience! This entry was posted in Camp News and tagged Beauty and the Beast, camp for girls, Camp Lochearn, Camp Lochearn for Girls, Lochearn Camp, Lochearn Camp for Girls, Lochearn Lassies, New England Residential Girls Camp, New England Summer Camp, Residential Girls Summer Camp, Residential Summer Camp, Sleepaway Camp, Sleepaway Summer Camp, Summer 2018, Summer 2019, the Bagpipe Newsletter, Vermont girls camp, Vermont Summer Camp, Water Trampoline, Winter Newsletter on March 26, 2019 by Lochearn Admin. We can’t wait for these Special Trips and Programs! At Lochearn, we eagerly embrace new opportunities and strive to provide exciting adventures and special programs that will benefit our campers. We are so excited for everything we have in store for our campers this summer! It’s FIELD TRIP time and an exciting summer to be a Junior at Lochearn. 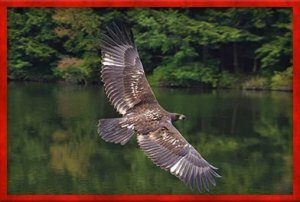 Our 1st-4th graders will be going to the Vermont Institute of Natural Science (VINS) for a super fun field trip including a Raptor Exhibit! 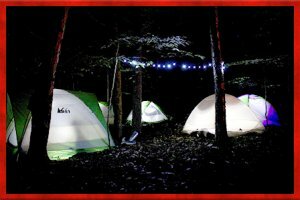 Our 5th graders will have the opportunity to camp out with Girls in the Woods this summer, a true tent campout with a campfire story, roasting s’mores, gazing at the fireflies, enjoying the Vermont night sky and sleeping under the stars. Stacie can’t wait to go berry picking with you! Lochearn is our name and Adventure is our game! 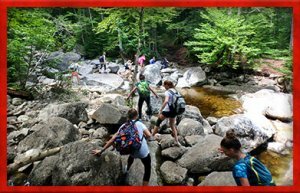 Our 6th graders will be the first group to have their own challenging but incredible fun day hike! The special bonds that come with hiking to the summit of a mountain together are the best part of our Outdoor Adventure Program. It is so much fun to celebrate Vermont and the special parts of why people travel to New England. 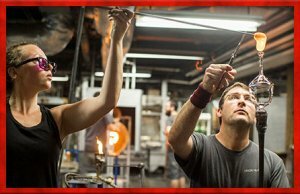 7th graders, get ready for a unique experience exploring the craft of glassblowing at Simon Pearce in Quechee, VT! 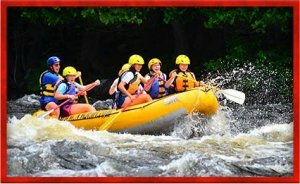 Our 8th graders will get to go White Water Rafting on the Androscoggin River this summer! This day trip is packed with two White Water Rafting runs and a gourmet lunch enjoyed together by the river. We can’t wait for this year’s CT Bucket List, trip to North Conway and Mount Washington, Blue and Green events, Big Sisters and Little Sisters, and the CT’s night out in Hanover! CITs will take an overnight trip to Burlington and have their own CIT Service Project! This entry was posted in Camp News and tagged camp for girls, Camp Lochearn, Camp Lochearn for Girls, Lochearn Camp, Lochearn Camp for Girls, Lochearn Lassies, New England Residential Girls Camp, New England Summer Camp, Residential Girls Summer Camp, Residential Summer Camp, Sleepaway Camp, Sleepaway Summer Camp, Summer 2018, Summer 2019, the Bagpipe Newsletter, Vermont girls camp, Vermont Summer Camp, Water Trampoline, Winter Newsletter on March 20, 2019 by Lochearn Admin. Each summer brings a new opportunity to make the most out of the time we have together in Vermont. There are many ways to do this, but how can we recircuit our mindset to bring in even more inclusiveness and kindness into our community? Think about this: At some point, we were all new at camp. Maybe we were a new camper when we were in 2nd grade, or maybe our first experience at camp started when we were 14. You may be a staff member that has spent many years at camp as a camper, but you are new to Lochearn. 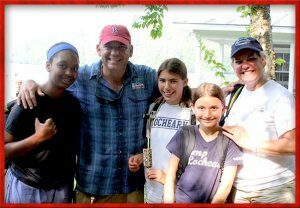 No matter where you are in your camp journey, we each have an opportunity to create an environment where every one feels confident, valued and enriched by the sleepaway camp experience. At Lochearn, we have the Courage to be Kind in everything we do: Kindness toward each camper and staff member, kindness toward the natural environment around us, kindness to ourselves, and committing to bringing kindness back into our hometown communities throughout the year. It is not easy to be 100% kind all the time, but if you keep the Lochearn Motto in your mind throughout your daily life, the task does not seem so far out of reach. Have the courage to be kind no matter what. We can’t wait to be back on Lake Fairlee with you! This entry was posted in Camp News and tagged camp for girls, Camp Lochearn, Camp Lochearn for Girls, Directors' Message, Lochearn Camp, Lochearn Camp for Girls, Lochearn Lassies, New England Residential Girls Camp, New England Summer Camp, Residential Girls Summer Camp, Residential Summer Camp, Sleepaway Camp, Sleepaway Summer Camp, Summer 2018, Summer 2019, the Bagpipe Newsletter, Vermont girls camp, Vermont Summer Camp, Water Trampoline, Winter Newsletter on March 13, 2019 by Lochearn Admin. 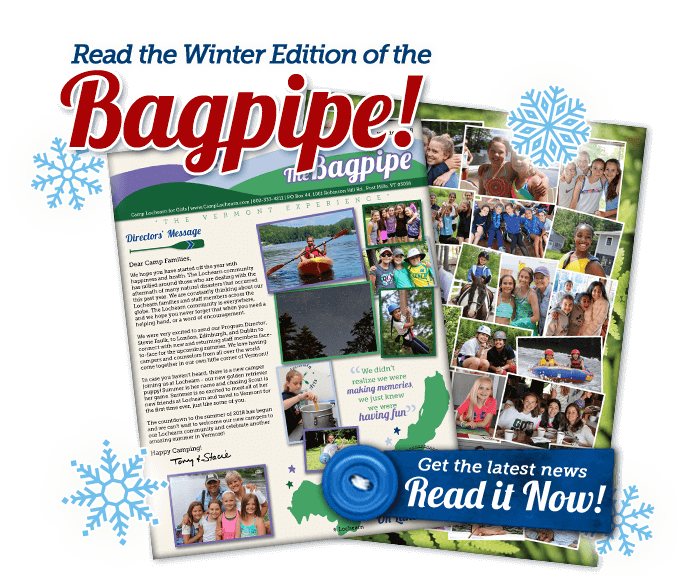 The Winter Edition of the Bagpipe is Here! 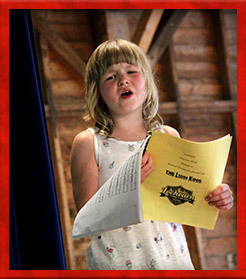 This entry was posted in Newsletter and tagged Beauty and the Beast, camp for girls, Camp Lochearn, Camp Lochearn for Girls, Lochearn Camp, Lochearn Camp for Girls, Lochearn Lassies, New England Residential Girls Camp, New England Summer Camp, Residential Girls Summer Camp, Residential Summer Camp, Sleepaway Camp, Sleepaway Summer Camp, Summer 2018, Summer 2019, the Bagpipe Newsletter, Vermont girls camp, Vermont Summer Camp, Water Trampoline, Winter Newsletter on March 7, 2019 by Lochearn Admin. 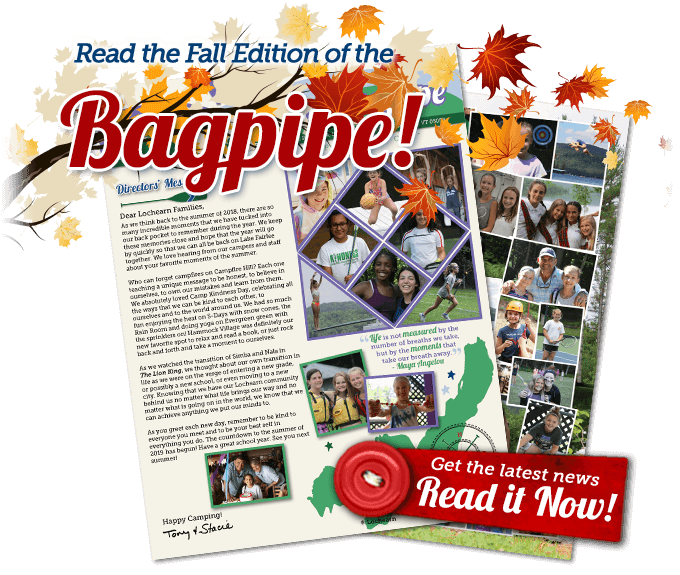 The Fall Edition of the Bagpipe is Here! 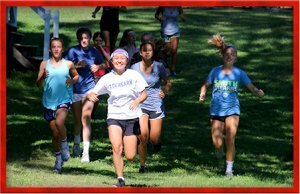 This entry was posted in Camp News, Newsletter and tagged camp for girls, Camp Lochearn, Camp Lochearn for Girls, Fall Newsletter, Lochearn Alumni, Lochearn Camp, Lochearn Camp for Girls, Lochearn History, Lochearn Lassies, Lochearn Tradition, New England Summer Camp, Summer 2018, Summer 2019, the Bagpipe Newsletter, Vermont girls camp, Vermont Summer Camp on November 13, 2018 by Lochearn Admin. 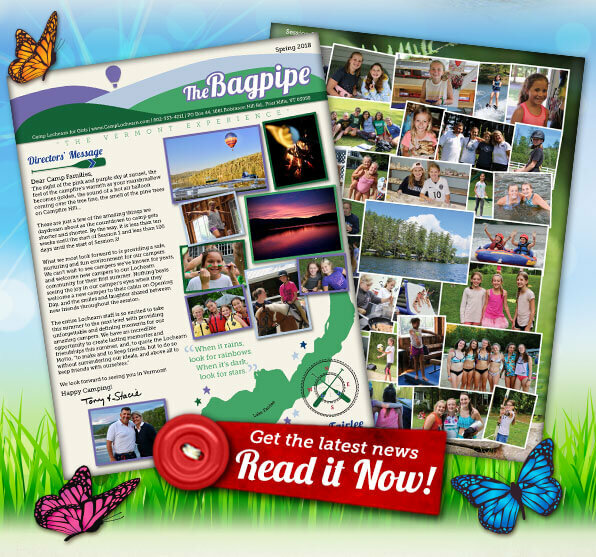 The Spring Edition of the Bagpipe is Here! 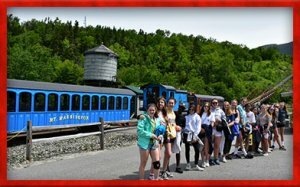 This entry was posted in Newsletter and tagged camp for girls, Camp Lochearn, Camp Lochearn for Girls, Lochearn Camp, Lochearn Camp for Girls, New England Summer Camp, Spring Newsletter, Summer 2018, the Bagpipe Newsletter, Vermont girls camp, Vermont Summer Camp on May 10, 2018 by Lochearn Admin. The Winter Edition of the Bagpipe is Out! 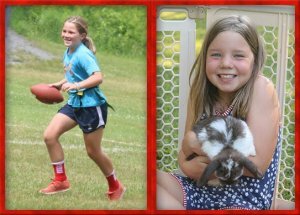 This entry was posted in Camp News, Newsletter and tagged camp for girls, Camp Lochearn, Camp Lochearn for Girls, Lochearn Camp, Lochearn Camp for Girls, New England Summer Camp, Summer 2018, the Bagpipe Newsletter, Vermont girls camp, Vermont Summer Camp, Winter Newsletter on March 1, 2018 by Lochearn Admin. 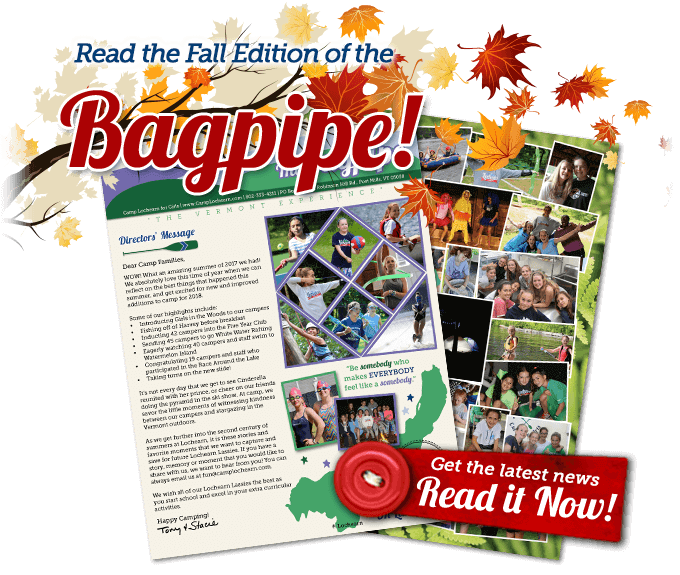 The Fall Edition of the Bagpipe is Out! 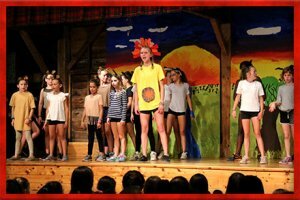 This entry was posted in Camp News, Newsletter and tagged camp for girls, Camp Lochearn, Camp Lochearn for Girls, Fall Newsletter, Lochearn Camp, Lochearn Camp for Girls, New England Summer Camp, Summer 2018, the Bagpipe Newsletter, Vermont girls camp, Vermont Summer Camp on November 2, 2017 by Lochearn Admin. As the end of summer arrives, you start to feel it. We call it Campitis. After a month at Lochearn, it’s the feeling you get when you long for everything that made camp special. You miss the lifelong friendships you made, your inside jokes and the camp songs. These are the things that stay with you, but you miss the little things, too. Like the unforgettable smell coming from Highland Hall when there’s warm tacos for lunch, or the screams of excitement that come with the reveal of camp’s evening program. And you just long for the daily routine, from waking up to the bugle and catching the sunrise over Lake Fairlee, to the harmonious calls of the loons that seem to echo across the water. But most of all you miss who you could be at Lochearn – yourself. You explored new passions, from beads and bracelets to archery and water sports. You miss how you felt when you won your first blue award in an activity you’d never tried before. You miss the sound of the wind filling your sailboat as you take a deep breath of the cool Vermont air. You miss your new best friends, who in just a month have become as close as sisters. Campitis is when you find yourself missing camp and everything that came with it, and you might find yourself feeling it when you least expect it. Is there a simple fix for Campitis? We wish it were easy, but the only cure we’ve found is to get back to camp and leave your worries at the gate! The school year may seem like an eternity, but we suggest glancing back at all of your camp photos, wearing your Lochearn gear to school and keeping in touch with your cabin mates from the summer. They could be experiencing some Campitis of their own and are hoping you’ll reach out! If these don’t help cure your Campitis, just know sometimes there’s nothing better than counting down the days until you’re back on the banks of Lake Fairlee! 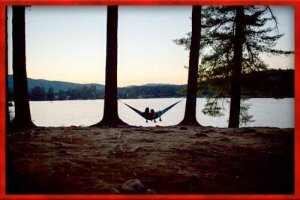 This entry was posted in Camp News and tagged Camp Lochearn, Camp Lochearn for Girls, camp memories, Campitis, girls camp, Lochearn Camp for Girls, Lochearn Lassies, New England Summer Camps, Vermont girls camp, Vermont Summer Camp, VT summer camp on October 11, 2017 by Lochearn Admin. 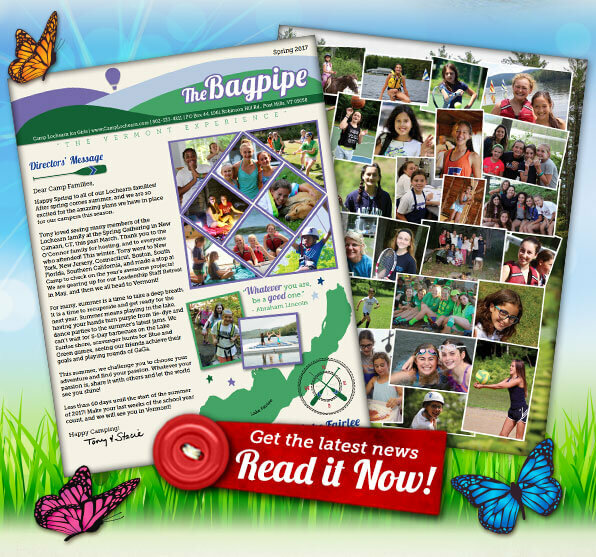 The Spring Edition of the Bagpipe is Out! 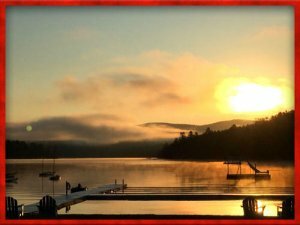 This entry was posted in Newsletter and tagged camp for girls, Camp Lochearn, Camp Lochearn for Girls, Lochearn Camp for Girls, New England Summer Camp, Spring Newsletter, Summer 2017, the Bagpipe, Vermont girls camp, Vermont Summer Camp on May 8, 2017 by Lochearn Admin.